This Week: Decided to suddenly start accessorizing the girls room the same time we're putting Johnny's together, and have been having a blast making little odds and ends for them both!! Can't wait to have them finished enough to include them in the home tour, because I really wanna hear your opinions. -Went to, and had a total blast at my quilters guild. Those ladies are so incredibly inspirational! I always leave feeling to stoked to get sewing, and already have a new list! -Been staying up late every night this week and still not caught up, but I'm wondering if this isn't more of a lifelong pursuit, to feel as though I'm 'caught up'. haha At any rate I have been getting lots done and having fun while doing it. If I own you an email however I'll apologize in advance!! My email has been holding several hundred messages hostage without my knowledge, and I'm trying my hardest to answer them all asap! 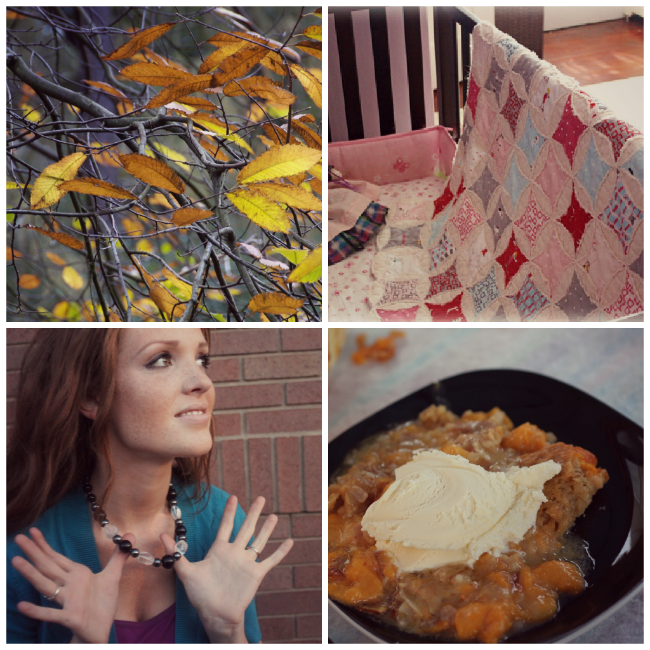 Weekly Snapshots: turning leaves, pink ragged stitchery, sweetest gifts, and peach cobbler. I have seen enough Pumpkin Recipes around to keep me baking for the next 40 years. I listened to about 8 hours straight of the Ellen Show on youtube while working one night. Haven't giggled straight for so long in a while. No matter how much I get doen I never fell caught up lol There is always something else that needs to be done. I love Ellen. She makes me laugh so much. I'd love to go to one of her shows someday. I loveeee that necklace! & yes I've read SOO many pumpkin recipes too --thanks to pinterest! If only it was autumn year round!